For five years now, relations between the Russian military and their colleagues from NATO countries have remained cool. 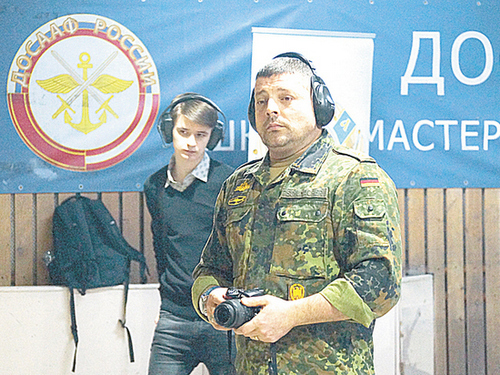 DOSAAF of Russia tried to build bridges and organized competitions in bullet shooting between members of the Russian Club of military leaders and foreign military attaches accredited in Moscow. The correspondent of “MK” witnessed a stubborn struggle at the shooting range. Before the briefing, the military attaches at the embassies of China, Germany, France, Slovenia, Serbia, the Republic of Korea and Chile got acquainted with the shooting arsenal of the DOSAAF shooting gallery not without interest. There are even replicas of the legendary weapons – the Maxim machine gun and the PPSh submachine gun. At an improvised exhibition, Assistant Military Attache of Serbia on defense issues, Jovica Basanic, dismantled and assembled a Kalashnikov assault rifle. – Familiar weapon? – I ask. “We are the same,” he responds in good Russian right off the bat. The US naval attache, William Witsitt, was late for instructions and therefore did not participate in the competitions. Although he was allowed to shoot at his pleasure. It is good that he arrived, and recently the US military representatives, unlike other foreigners, often ignore official briefings by Russian officials. For example, for the annual meeting of the attache with the head of the State Duma Committee on Defense, Vladimir Shamanov, the American military did not have time. The shooters were divided into groups of 6 people. And mixed up. Our and foreign military fired Makarov and Austrian Glock-17 pistols. And here is the command “fire!”. From shots with unaccustomed lays ears. But not all. The prudent Germans took earplugs with them. Well, and then everyone armed themselves with headphones, which at first many ignored. One group of shooters at the firing line replaces the other. Along the way, preliminary results and properties of weapons are vividly discussed: “it is better to aim at the eight,” “take it higher,” etc. Again on the firing line. The officers of the attache prefer to take the correct stand for firing – by expanding the hull, our veterans are not particularly tense. Someone shoots, putting his left hand in his trouser pocket. The task of the competitors is to score the maximum number of points. The six best ones based on the results of the first stage are sent to compete in duel shooting. The conditions are simple: knock out all targets faster than the enemy. Two finalists make two series of shots – who will be more accurate and fast. The final turned out to be dramatic. The Chilean officer and Colonel-General Vladimir Boruchenko agreed. In the first round, the victory for the Russian military, in the second – for the guest from Latin America. The third round, and … targets hit by duelists almost simultaneously. The judges decided that the Chilean was more accurate. Victory is his. But rivals are not offended and shake hands with smiles. In the meantime, the points scored by the contestants during the shooting are coming to an end. The result is unexpected: the whole pedestal, all three first places are taken by Russian military leaders. First place for Colonel-General Vladimir Boruchenko. He was born in 1940. The veteran, who next year is 80 (!) Years old, receives the main prize of the competition. The representative of the United States, unlike other foreigners, did not remain at the reception – service. “He has another report to write home to,” jokes the head of the Commanders Club, former Interior Minister, Army General Anatoly Kulikov. An unusual contest showed that the Russian and foreign military could easily get along. Well, and compete with weapons in hand is still better in the dash.